Toyota City, Japan, Feb, 08 2019 - (ACN Newswire) - The Toyota Yaris WRC will return to Rally Sweden, scene of its maiden victory, for round two of the 2019 FIA World Rally Championship season. Drivers Ott Tanak, Jari-Matti Latvala and Kris Meeke will look to build upon a promising start to the campaign for TOYOTA GAZOO Racing World Rally Team on Rallye Monte-Carlo, on what is the only full winter rally on the calendar. On Rally Sweden, metal studs inserted into the tyres provide significant grip, helping to make it one the season's fastest events. Drivers can 'lean' their cars on snow banks at the side of the road to carry more speed through corners, but in warmer conditions the snow banks can disintegrate and cars can get stuck in them. The rally is based in Torsby, close to the border with Norway, where much of Friday's action takes place. That's after an opening super special stage in Karlstad on Thursday, which is run for a second time 48 hours later. With the itinerary largely unchanged from 2018, classic Swedish stages Hagfors and Varg?sen feature on Saturday with the returning R?mmen. The rally concludes on Sunday with the Power Stage ending at the Torsby service park, following two runs over the Liken?s test. Latvala is a four-time winner of Rally Sweden, including the first victory for the Yaris WRC two years ago. On this year's event will set a new record for the most WRC starts ever by a driver (197), surpassing the tally of another famous Toyota driver, Carlos Sainz. For the first time, a fourth Yaris WRC will also be in action on the event, driven by the returning two-time world champion Marcus Gr?nholm and entered independently by his own GRX Team. "After our very good start to the season in Monte Carlo, I am sure that we are ready to fight for the win on Rally Sweden. Last year we struggled a bit there with our road position and the conditions, but I think that this year we have a better position relative to our rivals and we don't need to worry about that too much. We have done very good preparation for this event with our testing in Finland over recent weeks, and we know that our car should be well-suited to the fast stages there." "We are feeling well prepared for Sweden, but it's always difficult to know exactly what conditions we are going to face during the event. Last year we had a lot of snow and big snow banks, which is usually what you want on a winter rally. It was hard for us to compete with our road position though, because there wasn't a lot of grip available in the fresh snow. I'm hoping that we'll have a better chance this year to fight at the front. When the conditions are in your favour, it can be a really fun event with such fast and flowing stages, and we know that our car can be really good there." "This year's Rally Sweden is going to be very special for me. It's where I became the youngest ever winner of a WRC round, and now I am set to become the most experienced WRC driver, on the same event, just 11 years later. At the moment we have a good amount of snow here in Finland and I am expecting the conditions to be similar in Sweden, so we should have a really nice winter rally. Hopefully we can be fighting for another great result like we had in Sweden in 2017 with the first win for the Yaris WRC. I just need to get the feeling for the driving that I was missing in Monte Carlo." "Monte Carlo was a positive beginning for me but it doesn't change my immediate focus, which is on learning the car and enjoying my driving on the three very different events we have to start the season. I had a great three days of testing in Finland last week to prepare for Rally Sweden. It was really nice to experience the car for the first time with a snow setup. I came away with a really good feeling, but I'm keeping in mind that the conditions on the rally could be very different, depending on the temperatures. Hopefully we'll have nice, consistent conditions and a rally everyone can enjoy." 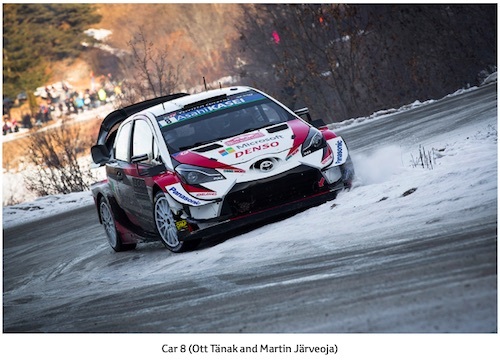 After its victory in 2017, TOYOTA GAZOO Racing experienced a challenging Rally Sweden in 2018, with conditions proving difficult for those at the front of the road order such as T?nak and Latvala, who finished ninth and seventh respectively. Esapekka Lappi recovered from an error on Friday to finish fourth overall, taking the position with a Power Stage win in the final test. TOYOTA GAZOO Racing World Rally Team is inspired by the motto: "ALL FOR WIN" as it competes throughout the 2019 season. Our goal in 2019 is to fight for all three crowns. All team members are aiming for this big goal together. We look forward to your continuous support!